During the winter season, most Americans experience low temperatures and an increase in utility bills, especially for the cost of heating their homes. This year with gas prices going up, the cost of food going up, and so many families bringing in less money per pay period it is important to save as much money on our heating costs as possible. Use Available Resources. A programmable thermostat is important- why heat the house at full capacity when you are sleeping? Setting your thermostat lower and layering up on the clothing and throwing more blankets and flannel sheets are also good tips. Zoned heating will also lower the heating bill- why heat the whole house when you are hardly in certain rooms, or one person likes the room cooler than others. Zoned heating will allow you to turn down the heat in certain rooms or turn it off completely. Insulate to Safeguard Heat. 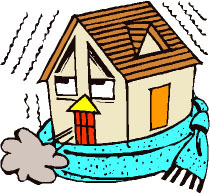 Up to 60 percent of warm air can be lost even before it reaches the register if your ducts are not insulated. The ducts in your attic and crawlspaces should be sealed. Otherwise, both money and energy will be wasted. Clean Filters and Registers. Cleaning filters (or replacing) and cleaning out the registers to make sure that nothing is blocking air flow will also help to reduce your energy bills. Also, double-check they are not blocked by furniture, drapes or any other obstruction. Conserve Warmth for Rooms Used. Close off access to registers in rooms that are not frequented. Prevent Heat Loss from the Water Heater. Insulation blankets are not very expensive (typically under $20) and are specifically designed to reduce the loss of heat. Simply wrap the blanket around the hot water heater, especially if you have an unheated basement. Buy Green. If you are in the position to purchase a new heating system then look for the most energy efficient model you can find. Energy Audit. Contact your local South Bay Area HVAC company to come out and do an energy audit on your home- they will determine what changes need to be made so that you can lower your energy bills.